Najdi speaking Arabs are part of the Bedouin, Arabian people cluster. The majority of Najdi speaking Arabs come Saudi Arabia but some come from Iraq, Jordan, Kuwait, and Syria. They speak four major dialects of Najdi Arabic: (1) Northern Najdi (spoken in Ha'il Region and Al-Qassim Region in the Najd), (2) Central Najdi (Urban Najdi - spoken in the city of Riyadh and surrounding towns and farming communities), (3) Southern Najdi (spoken in the city of Al-Kharj and surrounding towns), Badawi Najdi (spoken by the nomadic bedouins of Najd). 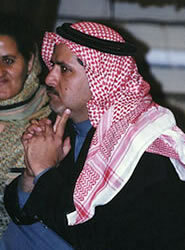 As a result Najdi speaking Arabs often have their own distinct accents. Najdi speaking Arabs are nearly all Muslim. Very few Najdi Arabs deviate from the Islamic faith, a monotheistic religion that follows the Quran and teachings of Muhammad. The region from which Najdi Arabs originate is known for its strict interpretation of Islam and is generally considered a bastion of religious conservatism, known today is Salafism. Pray that God would open the hearts and minds of Najdi Speaking Arabs. Pray that Churches will intentionally discover and engage this unreached people group in their locale sharing a message of Christ's love via their deeds and words.